In his 1887 book Birth of the Bravest, A History of the New York Fire Department, historian Augustine E. Costello remembered the Knights of the Round Table, one of the best known of the organizations of the old volunteer fire companies. "It originated among the members of Lafayette Hook and Ladder Company No. 6, located under Fireman's Hall, Mercer Street. It was organized in the fall of 1848, James P. Decker, Jr. being chosen the first present. The 'Knights' convened but once a year--Christmas Eve--and the occasion was one of great enjoyment." Those feasts took place in the basement of Fireman's Hall at Nos. 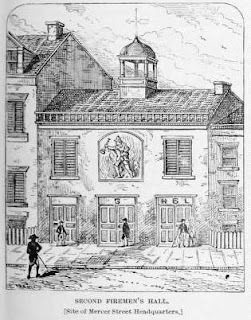 127-129 Mercer Street--a two-story frame firehouse which had replaced the original Fireman's Hall on Fulton Street. It was distinguished by a belfry and a prominent carving of a fire fighter over the truck bay. Fireman's Hall double as the firehouse of the Lafayette Hook and Ladder Company No. 6 and as the meeting rooms of the officials of the many volunteer fire companies. By the early 1850s Fireman's Hall was outdated. 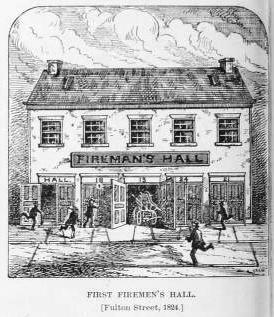 On Wednesday, November 30, 1853 the Board of Aldermen voted "In favor of building a new Firemen's Hall." Things progressed quickly and the various construction contracts were signed on January 6, 1854. Only seven months later the old Firemen's Hall was gone and construction of its replacement was far enough underway that the cornerstone could be laid. On August 19, 1854 The New York Times reported "Next Monday will be a great occasion for the Fire Department. A grand parade is to take place in honor of the laying of the corner-stone of the new Firemen's Hall in Mercer-street. The box placed into the cornerstone that day contained a history of the New York Fire Department since 1816, a history of the old Firemen's Hall, a Bible, a copy of the United States Constitution and a score of other documents, including copies of the local newspapers. The following day The New York Herald described the new Hall, designed by architects Field & Correja. The ground floor would house the New York Hose Company No. 5 and the Lafayette Hook and Ladder Company No. 6. "Each company is to have 15 by 90 feet, which will be divided in three rooms, the front room for the apparatus, the centre room for their meetings, and the room in the rear for sitting and reading." The second floor would contain a large meeting room--38 by 71 feet--"for the meetings of the representatives, the engineers and foremen, and the Exempt Firemen's Association. The topmost floor held an identically-sized room used as a library and reading room, and smaller rooms for the librarian and committees. "The front of the building is to be Connecticut brown stone, cut in the best manner. The style of architecture is Italian, or in other words, a composition of Greek and Roman details applied by the Italians to modern building." An over-the-top example of Victorian exuberance, Field & Correja's Firemen's Hall exploded with decoration. The name of the hall was carved above the central second floor window. The pilasters flanking the centered entrance were adorned with "emblems of the fire department, such as hook and ladders, torches, axes, trumpets, &c., and the tops of these antaes [pilasters] are to be surmounted with a fire hydrant." The architects salvaged the old fireman statue. The Herald reported "On the top of the cornice is to be a blocking course with three pedestals, the two side ones surmounted with a cluster of torches, and the centre one with the full size statue of a firemen--the same one who has stood sentry so many years in front of the old hall." A tympanum above the entrance doors contained bas-relief carvings of Protection and Benevolence; and on its keystone was carved a full-sized fire helmet. The New York Herald promised "The whole building is to be constructed in the most substantial manner." The completed structure cost $24,811--about $725,000 today. The volunteer fire companies were manned by locals called "laddies." The companies gained a reputation as rowdy, boisterous gangs whose fire houses were essentially social clubs. Despite their elegant new surroundings, the men of New York Hose Company No. 5 and the Lafayette Hook and Ladder Company No. 6 were no different. In 1855, when Ralph Waldo Emerson visited New York City, Walt Whitman, oddly enough, brought him here. Justin Martin, in his 2014 Rebel Souls, Walt Whitman and America's First Bohemians, wrote "For Emerson's visit to New York, Whitman took him to the Fireman's Hall, a raucous club on Mercer Street...Whitman, it seems, was trying to make a calculated impression. 'He shouted for a 'tin mug' for his beer,' Emerson would recall. Emerson emerged from that first meeting with a sense that Whitman was odd." When the Civil War erupted, Colonel Elmer E. Ellsworth, a close friend of Abraham Lincoln, organized the 11th New York Volunteer Infantry Regiment--known popularly as the Firemen's Regiment. 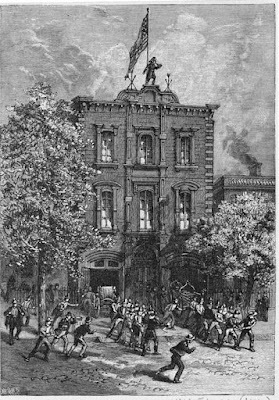 The troops were in Washington DC when insurgents attempted to burn down Willard's Hotel in Washington DC on May 8, 1861. Colonel Ellsworth, frustrated by a laddie's handling of the trumpet, snatched it. "With this he marshaled his forces," reported The New York Times. 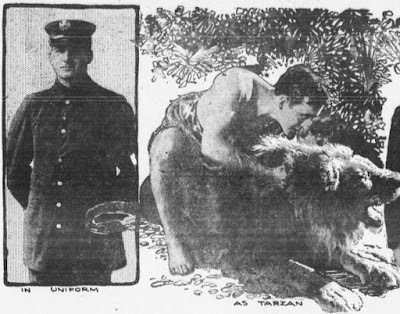 The newspaper added that the trumpet "will probably be sent to New-York for exhibition at Firemen's Hall. It is a queer-looking thing, shaped like a fish-born, and makes a toot which sounds for all the world like that familiar instrument." Less than two weeks later, on May 25, The Times would report shocking news regarding Colonel Ellsworth. "He has been assassinated! His murder was fearfully and speedily revenged...His memory will be revered, his name respected, and long after the rebellion shall have become a matter of history, his death will be regarded as a martyrdom." That night the Board of Engineers and Foremen of the New York Fire Department met at Firemen's Hall to discuss participation in the Colonel's funeral. In January 1865 a bill was introduced in the State Senate to establish a professional fire department. The New York Times noted it "has created a great excitement in fire circles, and among the better class of firemen it is not very favorably received." A meeting of the Board of Representatives at Firemen's Hall resulted in a unanimous resolution to use "every honorable means to defeat the bill for a paid Fire Department." The efforts failed, and on July 6 the Board meet again "for the purpose of making a final close of their business," as reported in The New York Herald. Two weeks later the Commissioner of the new Metropolitan Fire Department met in Firemen's Hall to arrange for the transfer of property from the old volunteer companies to the new Department. It was decided that Firemen's Hall would be used as Fire Department headquarters. 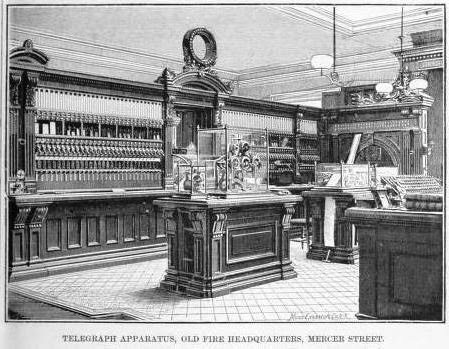 One of the first steps to modernize and consolidate the department was the installation of "fire alarm telegraph" boxes--the predecessors of today's call boxes. The central station was located in Firemen's Hall. The New York Herald described the apparatus on November 12, 1865 saying "The instruments used at the Central office and in the engine houses are very curious, very ingenious and well worth the attention of the public." While firefighters were now professionals, their rowdy, street-tough tradition remained. Hook and Ladder Company No. 6 was still housed in Firemen's Hall. While responding to a fire at No. 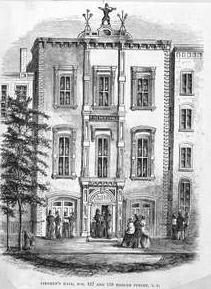 101 Walker Street in August 1865, its members were delayed by a physical altercation. On August 27 The Times reported "Engine Company No. 4 and Ladder Company No. 6 became involved in a fight while proceeding to the fire...The two antagonistic companies met at the corner of Sixth-street and Second-avenue, and the battle waged furiously for a few minutes; sticks, stones and wrenches were freely used, resulting in the injury of one of the men belonging to Engine Company No. 4." The Civil War term "torpedoes" covered a variety of explosives. In July 1871 a stash of military surplus was seized by the Bureau of Combustibles. Following an explosion on Beekman Street in September that year, the Fire Commissioners ordered "a rigid search for all combustibles of a similar nature throughout the city." New Yorkers were shocked when, on September 17, The New York Herald ran the headline "HIDDEN HORRORS" and reported "an examination of the cellar of Firemen's Hall was made, and eight cases of the same dreadful engines of death were found, which contained 40,000." The cache of torpedoes was taken onto the fire boat Fuller and dumped in the Hudson River. In his 1872 Lights and Shadows of New York Life, James Dabney McCabe successfully encapsulated Firemen's Hall. "The Headquarters of the department are located at 127 Mercer street, in a handsome building known as Fireman's Hall. Here are the offices of the Commissioners, the Chief Engineer, Secretary, Medical officer, Telegraph Bureau, Bureau of Combustible materials, and Fireman's Lyceum. The Lyceum contains a library of over 4000 volumes, and a collection of engravings, documents, and relics relating to the old Fire Department." In 1887 Fire Headquarters was moved to its new building on West 67th Street. Firemen's Hall continued to operate as a firehouse and by 1920 (by which time the address had been renumbered No. 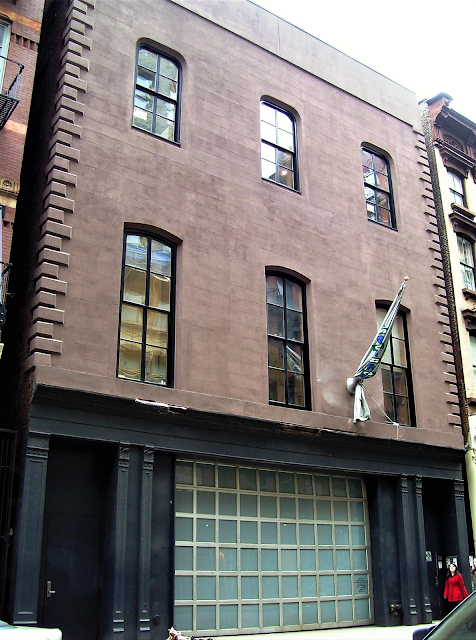 155 Mercer Street) was home to Hook and Ladder No. 20. That year one fire fighter, Eugene Pohler, left the department to gain fame and money. Pohler had been earning $1,400 a year as a firefighter. The 26-year old was described by Marguerite Dean in The New York Evening World as standing "6 feet 4 in his stockings, and weights 225 pounds." One morning motion picture director Harry Revere walked in the fire house door with a stockholder, George Merrick. 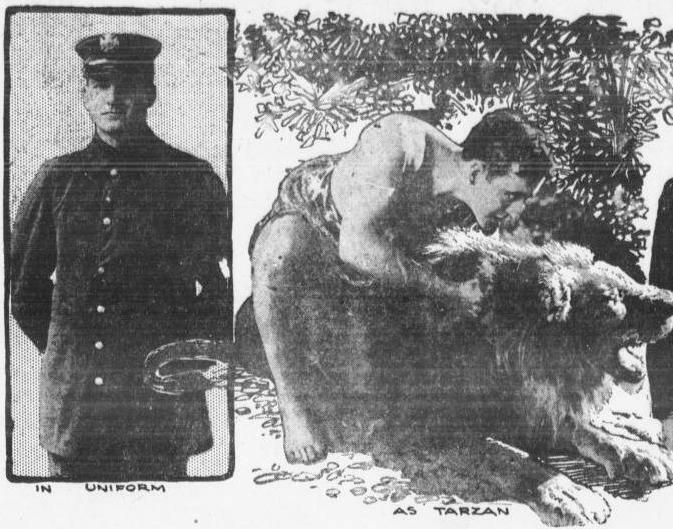 "They had been giving the Police Department the once over in a vain attempt to find a physically satisfactory Tarzan," explained Dean, "and somebody had told them about the young giant at No. 155 Mercer Street." Pohler (whose screen name would be Pollar) was perfect. With an offer of $5,000 a year (about $60,000 today); he walked off the job that day to became a celebrity. And after shooting his first picture, he told the reporter he did not miss fire fighting at all. "But now," Dean reported, "he admits that after playing around, a la Tarzan, with nine lions--one weighing 925 pounds--being a 'Smoky Joe' is about as thrilling as a Quaker meeting." In 1974 the Fire Department moved out of the old Firemen's Hall building. 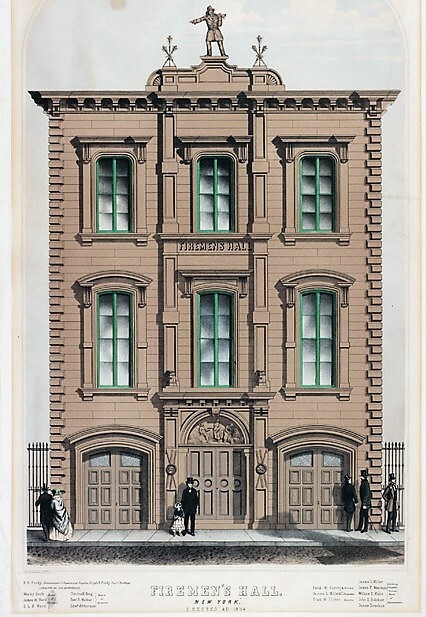 By then the Victorian facade had been shaved flat, leaving only the side quoins as any indication of the 1854 design. The fireman statue was salvaged; however its true location is difficult to ascertain. At least two museums claim to own the original. In 1981 a conversion resulted in "art and dance studios with accessory offices." By 1998 the Joyce SoHo Theater was in the building, sharing space with the Dia Center for the Arts. The building was purchased by Thor Equities in 2013, which announced its intentions to partially recreate the Firemen's Hall facade. After months of anticipation, the scaffolding and construction netting that obscured the work was removed in the summer of 2017. Preservationists and local residents could not possibly have hoped for nor expected what was revealed. The restoration, spearheaded by the architectural firm of PKSB, recreated the Italianate elements--going so far as to include the carved "Firemen's Hall" panel and the pediment originally intended to a life-size fireman statue. Hah! Apparently The Evening World got it wrong. Thanks for the research.